Order when available to reserve trees in your name, and then reply to your receipt or contact us with your requested ship date and we’ll schedule accordingly. 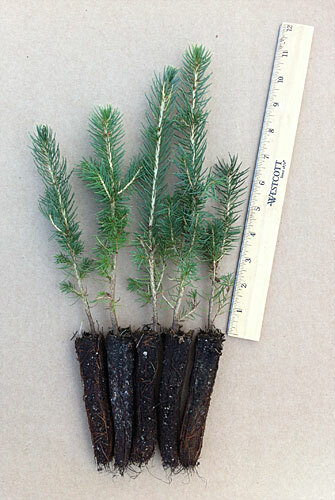 What are evergreen plug seedlings? Evergreen plug seedlings [a.k.a. evergreen seedling plugs] are germinated from seed in trays [not in the ground], each tray containing 198 cigar-shaped cells, each cell filled with peat moss, soil and other highly beneficial organic material. Evergreen seedling plugs are ready to ship when the soil in each cell has been taken over and “plugged” by the seedling’s roots. Plug seedlings are often transplanted by wholesalers for field growing because they are technically not dug up like “bare root” trees, leaving their root systems almost completely undisturbed. With this advantage, they can begin putting out new root growth and new top growth fairly quickly once planted. Plug seedlings experience much less stress during shipping and transplanting than bare root trees often do, and can be planted much earlier and later in the season than bare root trees. Our plug seedling sizes can range widely, from 4 to 20 inches [not including roots] depending on the species, but most of our plug seedlings average 6 to 14 inches. Please refer to the exact sizing info on each tree’s specific page. What are the advantages of evergreen plug seedlings? Winter shipments: Plug seedlings can be shipped from our site in MI at nearly any time of year, such as before the ground has thawed. Our bare root shipping season cannot start until the ground is thawed, but we can bring trays of plug seedlings indoors to thaw for shipment as wedding seedlings, corporate events or to southern states…pretty much whenever you like. 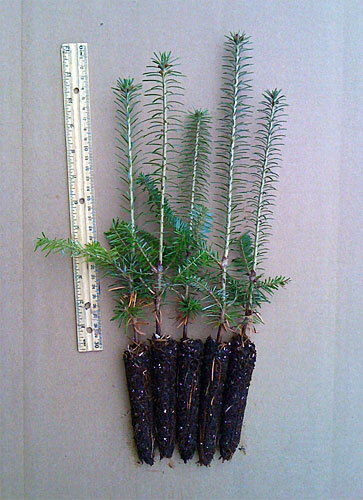 Late Spring/Summer shipments: Evergreen plug seedlings can be shipped long after they have broken bud or have begun candling [a time when bare root evergreens would die if dug and shipped]. At this time of year we generally pack them with their tender new top growth exposed to the open air inside the box, thus only temporarily interrupting their daily diet of sunlight and allowing them to pull moisture from their root plug and transpire it into the open air to keep cool. They actually keep growing during transit and keep their vitality much longer than bare root. This means plug seedlings can safely be shipped and planted even in June and even July, long after the traditional bare root season is done, because they are actually already planted when you open the box! Undisturbed root systems: Evergreen plug seedlings by their very nature are shipped with their root systems almost perfectly undisturbed and undamaged, unlike traditional bare root, because they literally pop out of the trays with virtually no stress or damage to the root system. Because of this undisturbed root system, they experience far less “transplant shock” during extraction/sorting/packing/shipping than bare root, which allows them to put on more growth than bare root in the same amount of time. Super fast planting: And perhaps the most important advantage of all from your point of view, plug seedlings are just jaw droppingly fast and easy to plant provided that you have an old 1 inch drill bit and a cordless drill. For many people, the amount of time and backbreaking work saved using this planting method [as shown in our plug seedling video on YouTube] often outweighs the lower cost of bare root seedlings. A promotional campaign by Hanes, using our evergreen plug seedlings in the product photos…click to enlarge. Pretty cool.